AthFest Educates announced its grant recipients recently, with $28,802 in total grants going to educators and youth development specialists to provide high-quality music and arts education for Athens area youth in grades K-8. $19,231 was awarded for music and arts programs and experiences for young people and $9,571 for instruments and equipment, bringing the total to date that AthFest Educates has donated to local teachers and educators to over $321,000. The largest grant went to the UGA Performing Arts Center for 4,450 Clarke County School District (CCSD) students to attend live school-day performances at the center. Winterville Elementary got a grant for 274 students to create their own stopmotion films. Lyndon House Arts Center got funding for 56 6th-8th grade students to participate in a program called “Wear It” with Community, where students learn to create their own fabric design, cut patterns, and sew their own “wearable art.” Because of AthFest Educates grants, over 1,000 local third-grade students will participate in Experience UGA’s programming with the UGA Fine Arts Theatre programs, and 35 3rd-grade girls will participate in a Puppetry Arts Program through the YWCO.The Bill Collins Memorial Grant went to Barnett Shoals Elementary where 78 5thgrade students will work with local professional artist Jamie Calkin creating watercolor portraits. In addition to the art- and music-based educational experiences students will partake in with AthFest Educates grants, over $5,500 for instruments was donated to four CCSD schools. Burney-Harris-Lyons got funding for Yamaha guitars,Timothy Road Elementary received funds for Orff instruments, Whitehead Road Elementary was awarded a grant to purchase Tubano Drums to enable more than 800 K-5 students to learn hand drumming techniques. Cleveland Road Elementary will get 16 ukuleles and 15 Snark tuners, so that, thanks to AthFest Educates, they’ll have a full class set. 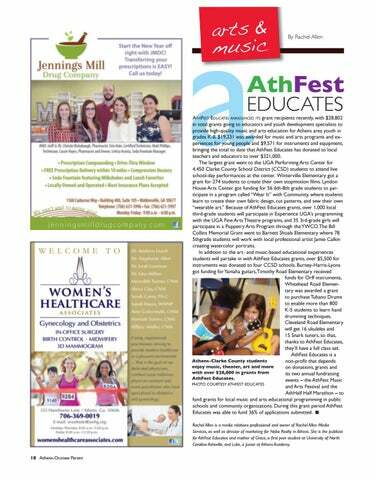 AthFest Educates is a Athens-Clarke County students non-profit that depends enjoy music, theater, art and more on donations, grants and with over $28,000 in grants from its two annual fundraising AthFest Educates. events – the AthFest Music PHOTO COURTESY ATHFEST EDUCATES and Arts Festival and the AthHalf Half Marathon – to fund grants for local music and arts educational programming in public schools and community organizations. During this grant period AthFest Educates was able to fund 36% of applications submitted. 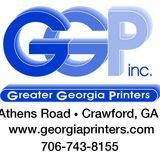 n  Rachel Allen is a media relations professional and owner of Rachel Allen Media Services, as well as director of marketing for Nabo Realty in Athens. She is the publicist for AthFest Educates and mother of Grace, a first year student at University of North Carolina Asheville, and Luke, a Junior at Athens Academy.